While bike commuting is a great way go to and from the workplace or school, the term utility biking encompasses not only commuting but all aspects of getting around while fulfilling day-to-day activities. With the right setup you can run just about any errand that you could with an automobile, such as picking up groceries and dry cleaning, dropping off packages at the post office, or running quick trips to the drug store. Utility cycling is a healthy, low-cost and efficient way to perform tasks around town, do your shopping or go out to social outings. 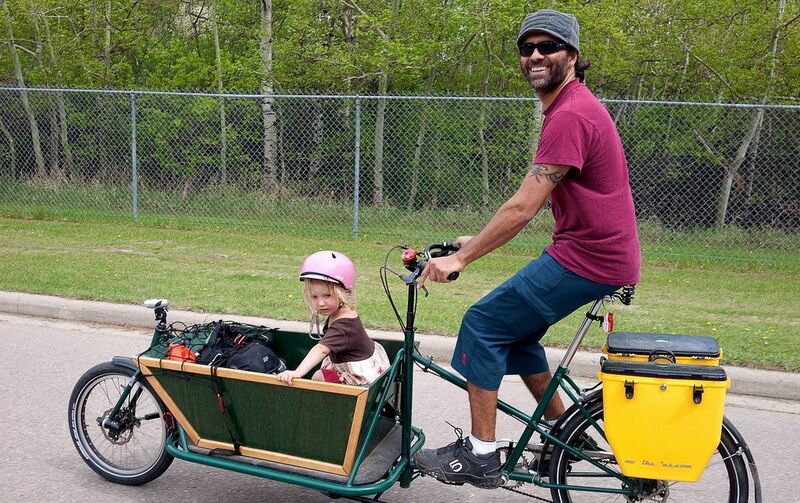 Utility cycling isn’t just for the private sector, either. Many businesses incorporate this practice into their daily operations, particularly in the delivering of goods or in service-related industries. 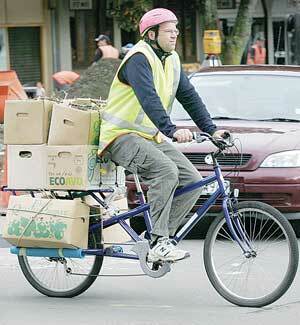 In most larger cities, bicycle couriers are a common sight, as well as patrolling police cyclists. Cargo bikes, which are designed to carry large loads, are able to give their van- and truck-driving counterparts a run for their money, especially in the more congested parts of the city. There are even bicycle taxi services available in some locations, which provides a fun and unique way to see the local sights. There are a number of different positive impacts that utility biking provides, both socially and economically, including improved personal and public health, a better overall quality of life, greater social involvement, improved physical fitness and coordination, and enhanced child development, as well as an improvement in road safety and a decrease in traffic congestion and pollution. In other areas of the world, cycling for utilitarian reasons is much more common than in the US. More than a third of all people in China are cyclists. In Shanghai alone, more than 60% of those cyclists pedal to work daily. In the Netherlands, bike capital of the world, 27% of all trips made are by bicycle. Compare that to a paltry 0.9% in the US. What Makes a Utility Bike? The thing that differentiates a utility bike from others is not so much the bike itself, but the accessories. These accessories are selected with two major goals in mind: 1) practicality, and 2) the ability to carry stuff around. For this reason, utility bikes are often equipped with things like kick stands, fenders, mudguards and chain guards to protect clothing, and baskets, bags, racks, panniers and even trailers for transporting goods (and kids or pets!). For safety reasons they will usually also have a bell, reflectors and front- and rear-mounted lights. Of course, for those who are serious about utility cycling there are bicycles specifically designed for utility use called cargo bikes. This style of bike usually comes with large racks and sports a longer body with a sturdy frame, allowing for a lower center of gravity which allows easier navigation and pedaling with heavier loads. When choosing a bike for utility use, there are a few criteria to keep in mind. Be prepared to spend as much money that you can reasonably afford, without skimping on quality. The bike should be easy to ride an upright position, with comfortable seating and handlebar style with quick and stable turning, braking and accelerating. Ideally, it will be relatively low-maintenance with single speed or 3-8 speed internal hub gears and able to hold up against various weather conditions. When it comes to the frame, the more durable and lightweight the better. You’ll need wider tires for stability, so make sure the frame allows for a size of 35mm or larger. The frame should also be able to be equipped with mudguards and a chain guard, if it isn’t already. Obviously, it will need to be able to facilitate attaching additional components as needed, such as racks, lights, bottle cages, etc. One issue that you’ll soon be faced with is how to secure your bike when you make a stop since it’s unavoidable that it will be left unsupervised for certain periods of time. More and more locations are beginning to make bike racks available, but the majority do not, which means you will often have to be creative about accomplishing this, just be aware of any nearby signs where you intend to park prohibiting you from doing so. 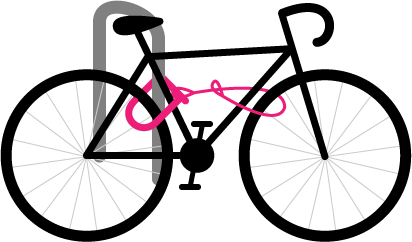 In general, it’s a good idea to always lock your bike wherever you leave it – it takes only a few seconds for someone to steal an unsecured bike so make sure it’s locked in a well-lit public area with lots of people passing. Always lock your bike to something that can’t be moved, cut, broken, sawed through or is tall enough to lift the bike over. Things like trees, posts, fences and grating are good examples. Only use the highest-quality U-lock you can afford as the cheaper ones that are available can be disabled in seconds with a hacksaw or bolt cutter. If possible use two locks and try to secure both a part of the frame and a wheel with each one. Ideal positioning of bike locks. Making the decision to start utility riding doesn’t have to be a difficult one. Start with just making short trips to the corner store, then as you become more comfortable you can make runs farther out and carry more items. You can be as casual or as dedicated as you prefer, venturing out only on fair-weather days, or choosing to brave the rain, snow and whatever else comes your way no matter what. The important thing is to get started! Any part you play, small or large, will help to make some difference, not only for yourself, but for the community. So stay safe and have fun! For more information on riding around town check out the Bike Commuting page.